This morning I was reading Rilke on how it’s not necessary for god to exist, since prayer creates him. 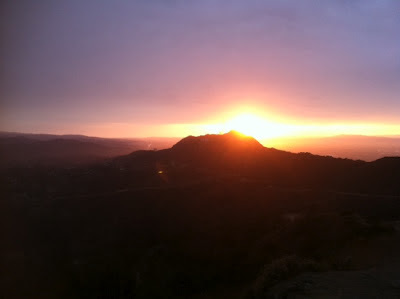 And if such prayer-created deity doesn’t persist, that’s all the better, Rilke asserts: we’ll just pray again and again. I think it’s possible to understand this, and still get some benefit from the ritual of prayer. This is the animal that doesn’t exist. so much that in the tranquil gaze of light, it lived. this pure creature. They always saved a space. a horn upon his forehead. Just one horn. and was in the silver mirror and in her. There appears to be some limit to the power of strictly mental existence. After the Middle Ages, lack of credible evidence eventually eroded the legend of the unicorn. (Or was it that there was no real emotional need for the unicorn to exist?) But we can still enjoy the unicorn as art. And the unicorn is still the heraldic animal of Scotland — perhaps presaging the doom of Scottish independence for now. Imagine having as your emblem an animal that doesn’t exist — though of course it DOES exist as a concept and as poetry. Platonists would argue that a symbol is more important than pedestrian reality. But if I may be pardoned for being Aristotelian: I wonder how many of our current beliefs will ultimately go the way of the unicorn. But, as Rilke says, it’s not necessary to believe in god in order to pray to him. In fact it’s the reverse: prayer creates god, at least in the psychological sense. The more often you pray (go to mass, make a pilgrimage, etc), the more real god will appear. Practice creates belief. Being exposed to religious art and sacred music deepens that effect. I’ve noted this effect also with New Age practices. People start going to psychics and Tarot readings “just for fun,” but within a year or so they may find themselves taking classes, joining a chanting group, and so forth. Contrary to the idea that belief comes first and action later, quite often action precedes belief. Hence the New Age doctrine of reversal: put the desired outcome first. Be happy, and the beloved comes. Love yourself, and the excess weight will melt with no effort. Start writing, and the inspiration will come. There are studies that confirm this. Artists still talk about the Muse – not always in the sense of the beloved who inspires creative work, but in the ancient sense of “Sing, heavenly goddess, the wrath of Achilles.” Yes, that beautiful divine being in a pleated tunic, holding a lyre. I could create the Muse in my mind, give her a name, say prayers, even create a little altar with seashells, a geode, candles, crystals – there are writers who do! But if a writer actually sacrificed a lamb to the muse, we’d see this as insane. Taking the subjective world literally to some degree is, well, a socially accepted sort of schizophrenia . . . But exceeding that degree becomes clinical schizophrenia. It's a very tricky terrain, and I can't exempt myself from "doing what comes naturally," i.e. harboring cognitive illusions. It's just how we evolved, and it's only when that tendency is pushed to extremes that we get pathology (typically paranoid schizophrenia) in place of poetry. And forgot to tell us why. Due to my recent computer NDE, I found myself with more time to read (no curse without a blessing, no blessing without a curse), and read Jesse Bering’s superb The Belief Instinct: The Psychology of Souls, Destiny, and the Meaning of Life. I read the chapters on destiny and “signs, signs everywhere” not once, but three times. This is an example of teleological (purpose-oriented) thinking (telos = end, goal). Young children, when asked a question such as “Why do mountains exist?” are likely to reply in terms of purpose: “So that animals have a higher place to climb.” Older children may shrug and say, “They just are.” Those who’ve had some science education can give a geological answer: volcanoes, and up-thrust mountains that result from the collision of tectonic plates. like a pretty ghost child. vanished like wind into wind. the word Emet, meaning Truth. And the Golem fell back to dust. reach the golden city of Prague? Arguably it’s a flaw that the poem could use a bit of autobiographical explanation. The incident at the wind harp happened when I felt confused and defeated about my calling. If I was “meant” to be a poet, if this was what I was “born for,” the Great Dream of my life – shouldn’t there be, after so many years, a real audience, beyond a handful of friends? I was thrashing after any confirmation that I ought to continue on my frustrating path, to the point of wanting to believe that being touched by this little girl with Down’s syndrome singled me out for a difficult destiny. After all, a folk tradition has it that “holy fools” can see a deeper truth. 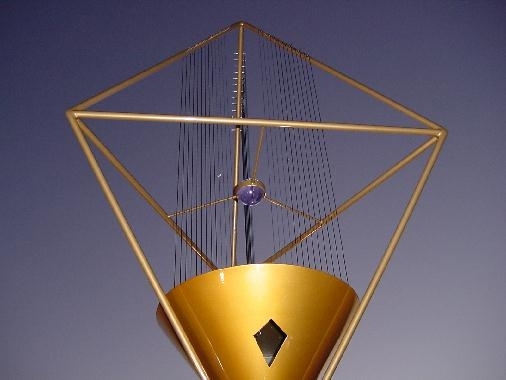 And it all took place near a wind harp – harp and poetry, need I say more? I wouldn't dream of speaking seriously in such terms, implying that everything has a secret meaning and “there are no accidents.” In conversation I would never assert that the child at the wind harp confirmed what my “destiny” was – a single, special destiny being as much a myth as the one and only “soulmate.” We make up our “destiny” as we go along. Some believe in a “divine plan” designed especially for them, but there is no evidence for it, no matter how many people testify before a TV camera, “I know I was saved for a purpose.” What about the three hundred others who went down with the plane, while one lucky would-be passenger had a flat tire on the way to the airport, and thus missed the departure? What was the divine plan for those who didn’t survive? But it would depress us to ponder that chance plays a huge role, so we reject this frightening hypothesis. During a storm at sea, D.H. Lawrence soothed his wife by saying, “Of course the ship won’t sink; after all, I am on it.” He wasn’t joking. He had a destiny to fulfill. the bronze mermaid slippery as tears. The human mind is nimble enough to read some kind of message or meaning in practically everything that comes to its attention. Fortunately, not everything comes to our attention, or we’d be overwhelmed. And that’s another factor we need to ponder in this strange game that the universe seems to play with us: SELECTIVE ATTENTION. While composing the blog, having just copied the Wind Harp poem, I went to the mailbox to pick up my mail, these days sadly dwindled to bills and advertising. This time it was a travel supplies catalog, and on its cover, a lovely view of Prague in a gilded late-afternoon light. Jungians would love this. The human brain is wired to seek pattern and meaning: randomness can never satisfy it. Enjoyed it thoroughly. Your unicorn poem belongs on this blog. and columbines its embroidered domain. Then they forgot about it. to touch it with a tender and imagined hand. Maybe it's not just that our brains are wired to perceive signs. My own feeling: in some sense they really are "out there" as well as "in here." After all, evolution is adaptation. Jesse Bering is good at explaining the adaptive value of seeing signs in things, and how natural selection worked to heighten this human capacity. Out of everything “out there,” we tend to single out certain things and occurrences as signs and omens because once that was crucial for survival. For instance, we are hard-wired to see "faces" in things -- this was useful for recognizing predators, with their frontal eyes. And even now -- or perhaps especially now -- it’s important that we recognize the emotions and intentions of people we meet. Can this become borderline irrational? It happens all the time. As Steve commented in another post, after making a decision, a friend of his “watches the universe for signs” and concludes on that basis whether or not the universe favors his decision (note the theory of mind here – this man animates the universe; the universe either likes or doesn’t like his decision, and will communicate its attitude). Our minds are very good at finding meaning in just about anything. But we should remember that it’s all interpretation. As the old rabbis said, a dream isn’t complete without an interpretation. That holds for just about anything we pay attention to. What is your view of Hillman “acorn” theory of destiny? You are referring to The Soul’s Code, in which Hillman proposes a kind of “DNA of the soul.” How I wish Hillman were still alive and could read Bering’s deconstruction of the soul, destiny, omens, and especially of the mind/body duality in general . . . All this Platonism really has to go. It's more than two thousand years out of date. At the same time, we should beware of falling into genetic determinism (I don’t think we need to reach for some imaginary and non-material “DNA of the soul” when the actual DNA encodes so much: intelligence, persistence, ability to delay pleasure, risk-taking versus caution. But even genes don’t have absolute power to determine who we are, how we “turn out.” That would be like claiming “god’s master plan.” Caroline Myss says somewhere that even which tomato you pick at the supermarket has been determined in advance as part of your destiny – “it’s that specific.” That’s absurd. The interactions with the environment are very complex. We shape ourselves as we go along. We invent ourselves – within limits. Contrary to blithe New Age pronouncements, no, we can’t be anything we’d like to be (Hillman would agree with that). I also like this perceptive statement by Hillman: “The current American identity as a victim is the flip side of the coin whose head brightly displays the opposite identity: the heroic self-made man, carving out destiny alone and with unflagging will.” But when we take a closer look at the “heroic self-made man,” he (self-sufficiency is a masculine ideal) is never 100% “self-made”; we discover a multitude of people and factors that helped shape the person. Usually the truth resides not at either extreme, but somewhere in between. If we are lucky, the dominant talent encoded in our genes will be allowed to develop and find an outlet. But a lot of people are not lucky, and besides, we tend to be gifted in several areas and may not have a single dominant talent that shows already at an early age. It’s more realistic to think in terms of several potential paths in life rather than a single “destiny.” But once we commit to a path, at the beginning it may be helpful to think of it in somewhat absolute terms. Remember, choice is stressful; eliminating choice and focusing on one path makes sense in terms of maximizing accomplishment and happiness (“why quitters win” – they concentrate on one thing). I’d call this a pragmatic view of destiny. Calling a particular path our “destiny” may help us focus and put enough work into developing the required skills that we achieve excellence, perhaps even become “extraordinary.” I suspect, though, that the concept of destiny will eventually fall into disuse as a leftover from archaic modes of thought. It’s not as bad as believing in karma from past lives, but if you get too literal about your “acorn” (or daimon or genius or guiding image or any other metaphorical-mythical representation of “destiny”), you get simplistic. There are many forces at work and in constant interaction; our knowledge of what shapes us and how and why we consciously try to shape ourselves is likely to remain partial. There are worse, ahem, fates. I love this image but don't know what the symbolism of the flag is. Also love the human face on the lion and the background of all the animals. Yes, both the lion and the unicorn are quite endearing. In fact all the animals here are. 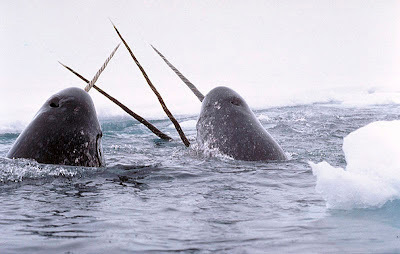 Note the wonderful flourish of the tails. 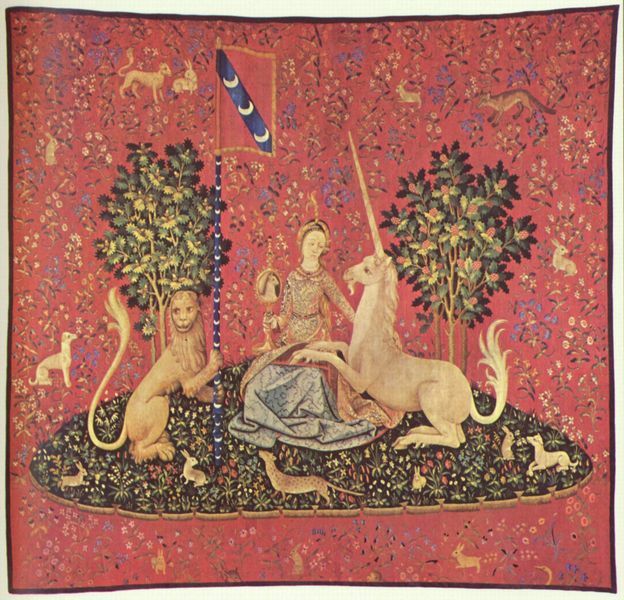 The banner is the pennant of the French nobleman Jean de Laviste, who at the end of the fifteenth century commissioned the six unicorn tapestries They are now at the Cluny Museum in Paris. 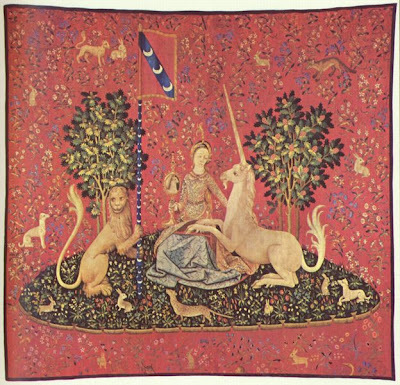 The background of the tapestry is known as the mille-fleurs design. 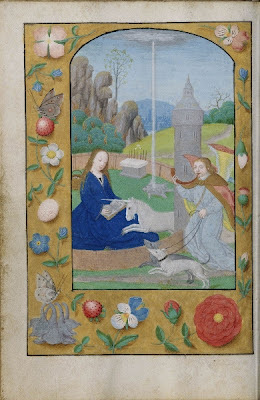 Interesting if an artist made a sacrifice of a lamb to a Muse 2000 years ago she would have been considered a pagan. Same is true today except it isn't politically correct to smite a lamb for any purpose unless a butcher does it. Love the story of the Down syndrome child, literally touching and the afterthoughts about it. Then there is the doctrine of trans-substantiation. As a child I was force-fed the belief that the communion wafer and wine literally became flesh and blood. Talk about organized schizophrenia . . .
It’s interesting that the crucifix wasn’t part of early Christian art. Early Christians preferred to depict paradise. The crucifix became dominant during the Middle Ages (I still can’t understand how humanity survived the Middle Ages). The girl with Down Syndrome was amazingly lovely and endearing. If I happened to be a mystic, I’d probably see her as an angel. But then the mind is awfully good at creating meaning. When the meaning stays private, it’s usually harmless. But if I took being touched by this “special” little girl as a sign that I am a prophet and should start preaching (some might argue that being a writer is similar), that could be a symptom of a psychotic breakdown. Sometimes the line between normal cognitive function, including seeing meaning in something we see or experience, and psychotic delusions, seems rather faint . . .
Oh no! Can’t you leave me the illusion of destiny just to tinker with. You are so right, and I’ve never seen it written before, that I have been all my adult life an atheist-poet-intellectual-literature professor navigating through written language omen by omen, synchronicity by synchronicity, searching for connections. As though humans are like ants in a colony, all connected on one wave length, and that wave length just might be poetry. And one day I understood that we, and all of the earth and its creatures, are made from the same star and are thus the same stuff. I had to look that far for connection, which might be the only truth that’s not an illusion, in the Hindu sense of peeling away the illusions so we can reach enlightenment. Actually, even the atoms in your right hand most likely come from a different stars than the atoms in your left hand. The reason is that it took the death of many stars to produce the atoms that now constitute our bodies. Every atom inside us was once inside a star! Now of course any of those atoms is in a very different configuration than billions of years ago. Who knows where it's been. Of course we are connected in all kinds of ways. We are of the earth, we are the children of the Universe. And there really are patterns out there -- just not necessarily the kind that correspond to our desires. But much is yet to be understood. I’ll leave it at that. I think Daoism is compatible with no personal deity, no destiny, and no afterlife. "Soul" in the sense of psyche dies when the brain dies. But we remain right here on earth in the memories of others, and through the ripple effect -- "the immortality of influence." I do have a blog on that: the accidentally hilarious interfaith panel on the afterlife. You'll love it. ARE LOVERS PRE-DESTINED TO MEET? This is lovely as poetry, but it's based on our tendency to think that because something happened, it HAD TO happen. Funny, it was Milosz, a public Catholic (though full of Gnostic doubt), who taught me this principle of cognitive bias. No, lovers are not predestined to meet. We could be wonderful "soulmates" with a thousand other people. But lovers always see each other as inevitable -- at least as long as they are in love. "Destiny" is an illusion. There are infinite other plots, perspectives, narratives -- as many as there are people, each with his/her own "contract with life." It’s not just that lovers aren’t predestined to meet. Nothing is predestined in this probabilistic universe. But the redeeming feature here is that we can learn lessons from whatever happens. Response is everything. Learning and growth are everything. Lawrence was a great early proponent of Melville, as was the Catholic poetess Viola Meynell, a friend of his in the 20's post WWI literary circle.